Roy has held numerous executive leadership positions in Chambers of Commerce and Economic Development organizations in Texas, Arizona, Ohio and Oklahoma. Some of these include the Texas Governor’s Office, the Texas Department of Commerce, the Greater Phoenix Economic Council (Arizona), the Greater Columbus Chamber of Commerce (Ohio), and the Oklahoma Department of Commerce. His experience in economic development has not just been limited to domestic activities. Roy also directed international trade and investment offices in Japan, China, Hong Kong, Singapore, Indonesia, Korea, India, Belgium, Germany and Mexico. Additionally, Roy was Partner, co-founder, and President of The Economic Development Group, Inc., an international economic development consulting firm with offices in Ohio and Arizona. In that capacity he helped build economic development strategies and tools for cities, counties, regional partnerships, states, utility companies, universities, private companies and even foreign countries. As well, he performed corporate site location consultant work for companies and executive searches for economic development organizations. Roy also has served on the faculty for several professional certification programs including the United States Chamber’s Institute for Organization Management and the International Economic Development Council’s Economic Development Institute. And he is an active participant of numerous domestic and international Councils and Associations, holding both membership and appointed positions. 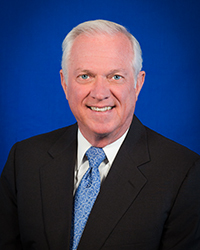 Nationally, Roy serves on the Board and Executive Committee of the American Chamber of Commerce Executives Association and on the Board of the International Economic Development Council. Statewide and locally, Roy serves on numerous Boards of Directors, some of which include the Oklahoma Business Roundtable, the Oklahoma Bioscience Association (Treasurer & Executive Committee), the State Chamber of Commerce, the Oklahoma State Fair, the Oklahoma Health Center Foundation, Oklahoma Chamber of Commerce Executives (Past President), Oklahoma Industries Authority, Downtown YMCA, the Oklahoma Technology Development Corporation - i2E (Chairman of the Board), Downtown Oklahoma City, Inc., United Way, Leadership Oklahoma City, Allied Arts, Myriad Gardens Foundation, the Governor’s Economic Development Team (2009 President) and several others. Roy has a Bachelor of Business Administration degree from Texas Lutheran University and pursued his M.B.A. at Sam Houston State University. As well, he is a graduate of the Institute for Organization Management at Southern Methodist University, successfully completed the American Chamber of Commerce Executive Leadership Program at the Center for Creative Leadership in North Carolina, and is a graduate of the Governor’s Center for Strategic Leadership for State Executives program at Duke University. In 2008, Roy was the recipient of the most prestigious award given by the American Chamber of Commerce Executives (ACCE) – the Chairman’s Award – for his significant contributions to ACCE and the chamber profession. In July 2012, Roy was elected and served as Chairman of the Board of the ACCE association. Also in 2012, Roy was given the Hall of Fame Award by the Oklahoma Chamber of Commerce Executives.